Leaving it to the last minute! In the summer I bought three Artemio small cube candle holders with every intention of decorating them for the table for Christmas. ...some London Bus on the edges...a few gems and some Star Dust Stickles...a bit of ribbon...red felt on the base...on the table and the glue isn't even dry yet! 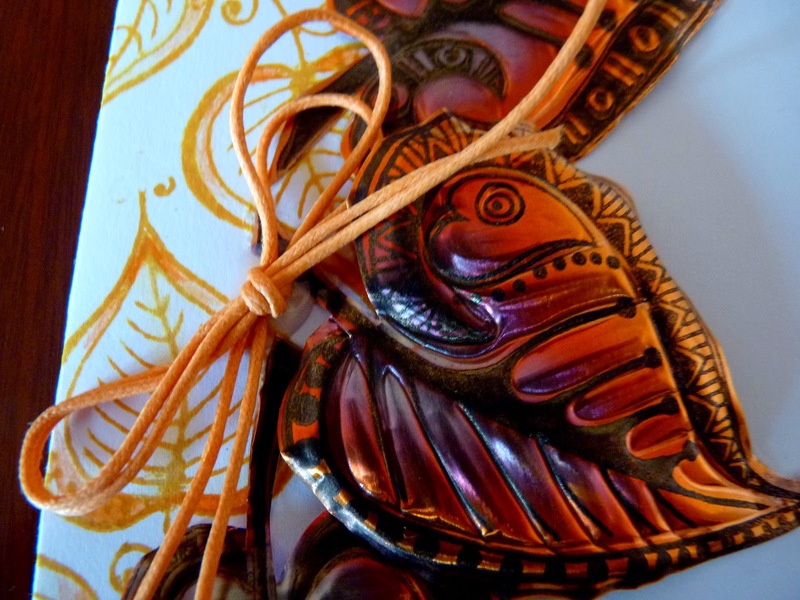 They will go beautifully with the coasters made at The Craft Barn with Helen Chilton earlier in the year. 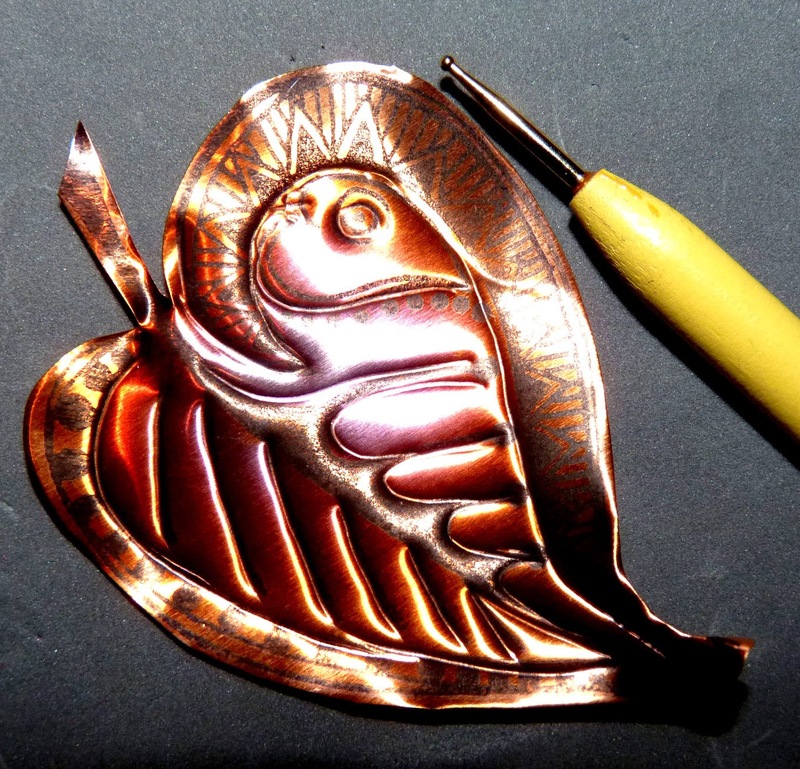 I started by stamping the leaves on to a sheet of copper and heating it with a heat tool until the copper started to change colour. The copper turned first deep orange, red, purple and then blue so by lingering over different parts a multi-coloured effect was obtained. 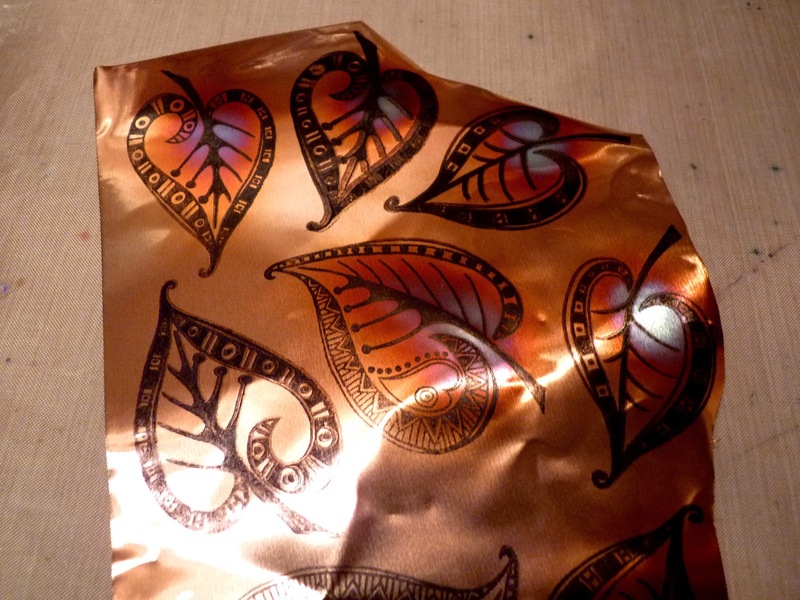 The leaves were cut out and the main patterns traced with a fine embossing tool on the front of the copper. 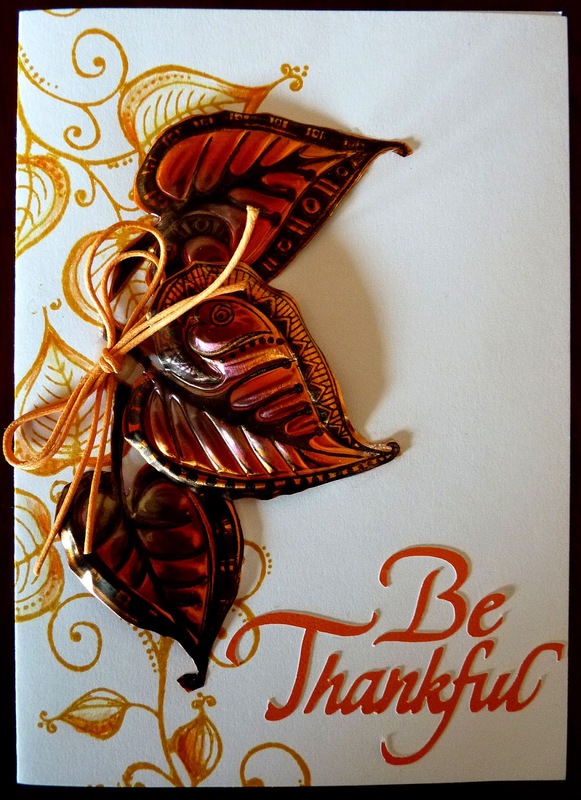 A larger embossing tool was used on the back to create even more dimension. 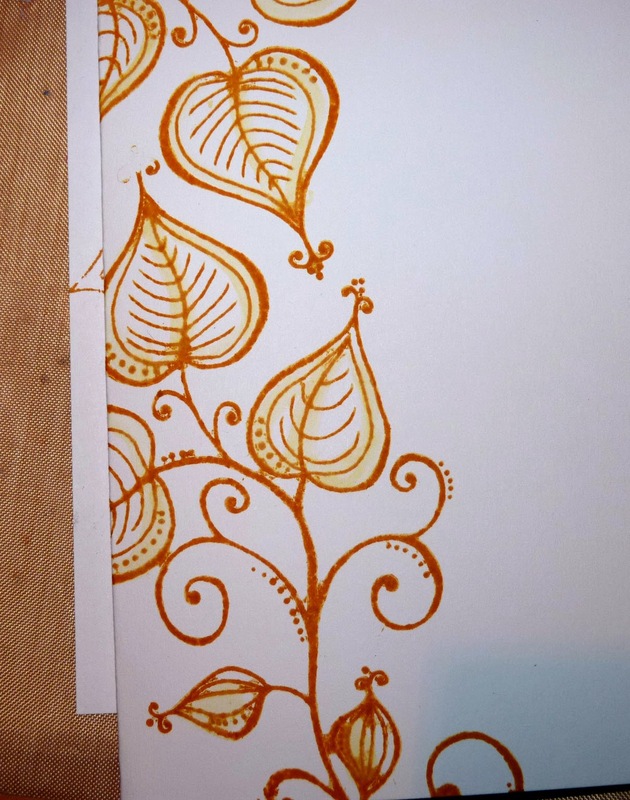 A leaf pattern was stamped in Distress Ink on to a card blank and shading added with a waterbrush. 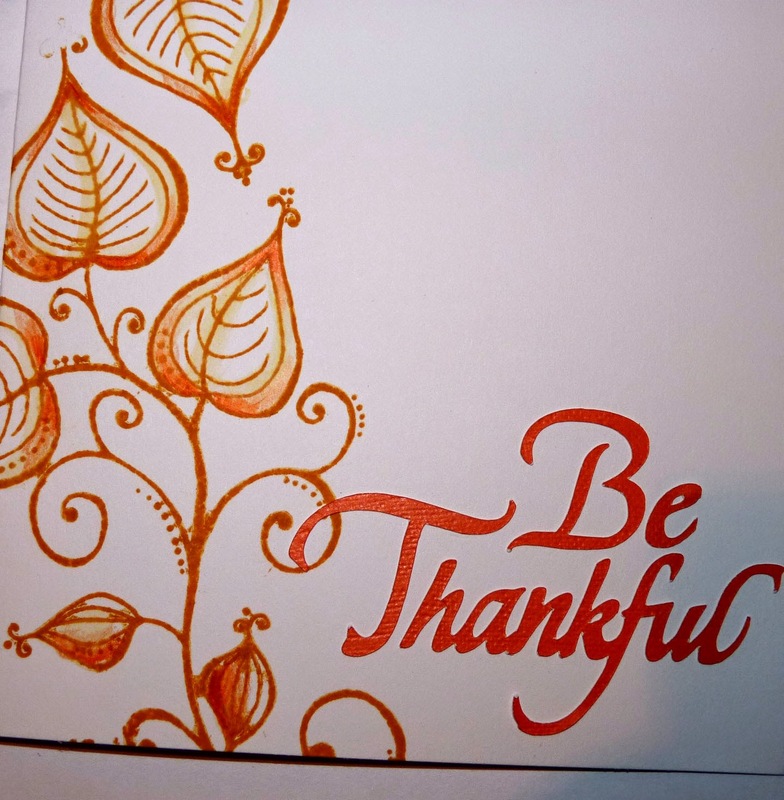 A little more colour and shading was added with an orange pencil and a digitally cut sentiment adhered to the bottom. Finally the copper leaves and a cord bow were fixed on with Glossy Accents. Whether this is a festival you celebrate or not it's always good to take time to celebrate and appreciate the good things in life, many of which are intangible and easily forgotten. Just a quickie. Not much time for crafting or blogging this weekend. Just a few minutes to make a birthday card for my favourite 7 year old! Cut with the Original Silhouette out of white card and coloured with Promarkers. A bit fuzzy as I struggled to get the stars and springs in focus. Time to start facing up to the fact that Christmas is fast approaching. 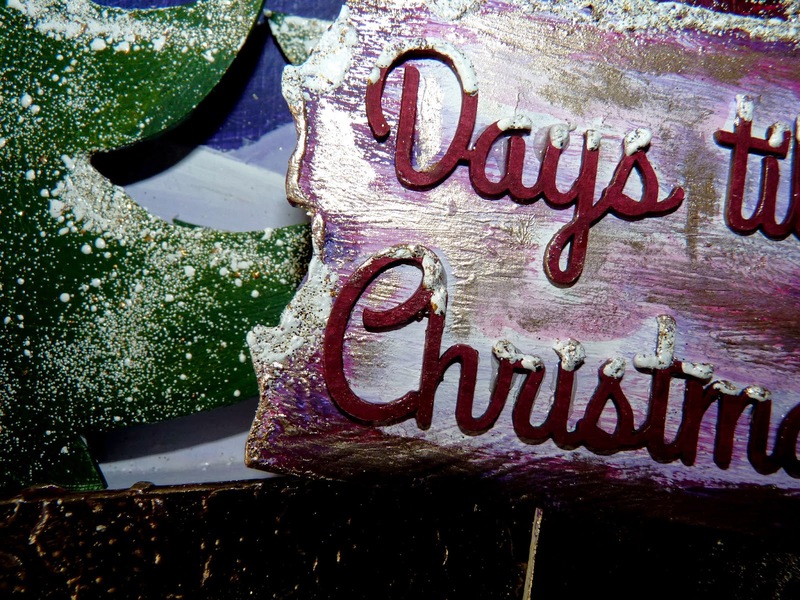 Here's something I've made to help keep track of the days using Tando Creative's Christmas Countdown Frame. 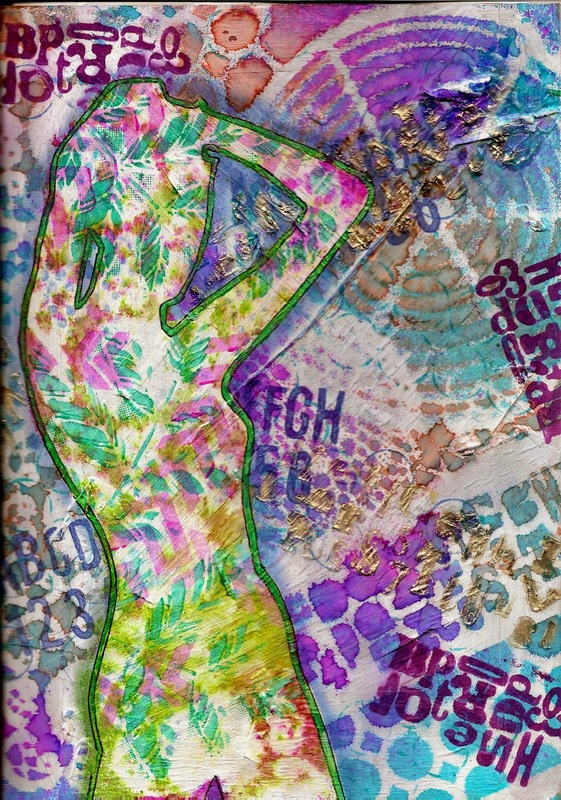 Grunge paste was added to the front panel using Tando's Grid Moroccan mask. When dry all of the pieces were painted with gesso and then Fresco Finish paints. The raised paste was highlighted with Treasure Gold. The edges were thickly embossed with Frantage embossing enamel and more was sprinkled over the frame to add extra sparkle. 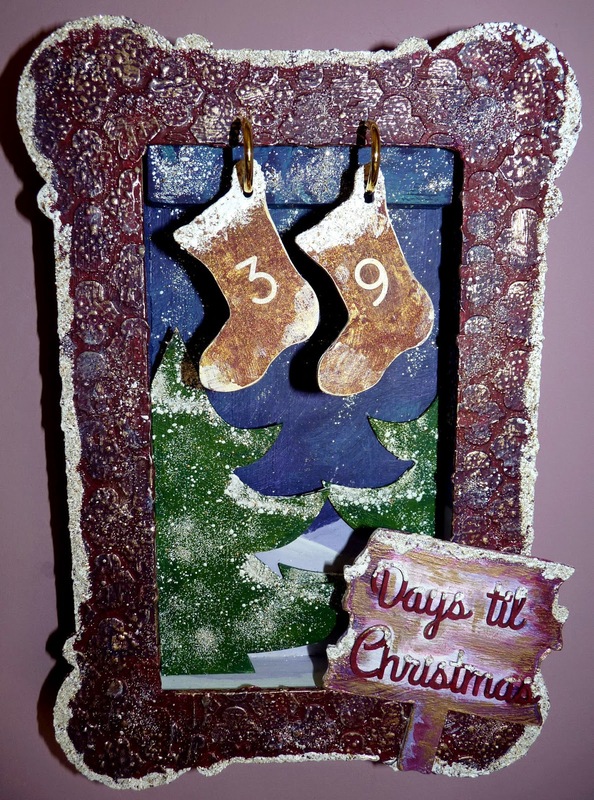 For a little extra shimmer the stockings were speckled with Prima Color Bloom Spray Mist. 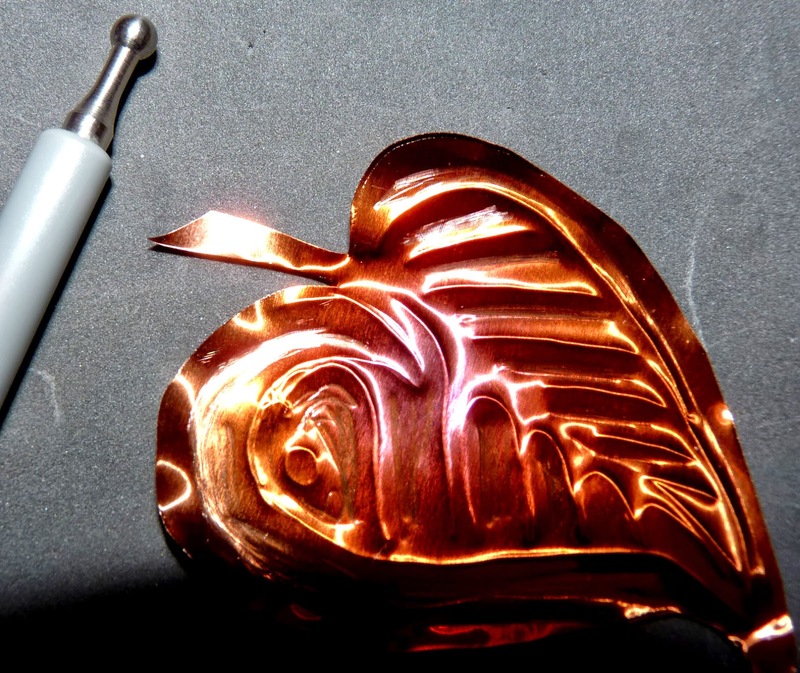 The pieces glued together easily with Cosmic Shimmer glue. As my sister is crazy about Christmas and this is a gift for her, the stockings are all double sided enabling her to start her countdown on 16th September with 99 days to go! I'm entering this in to Tando's Creative Challenge for November 'Something with a Use'...a very specific use! I'm just home from a completely fabulous day at The Craft Barn with Helen Chilton. 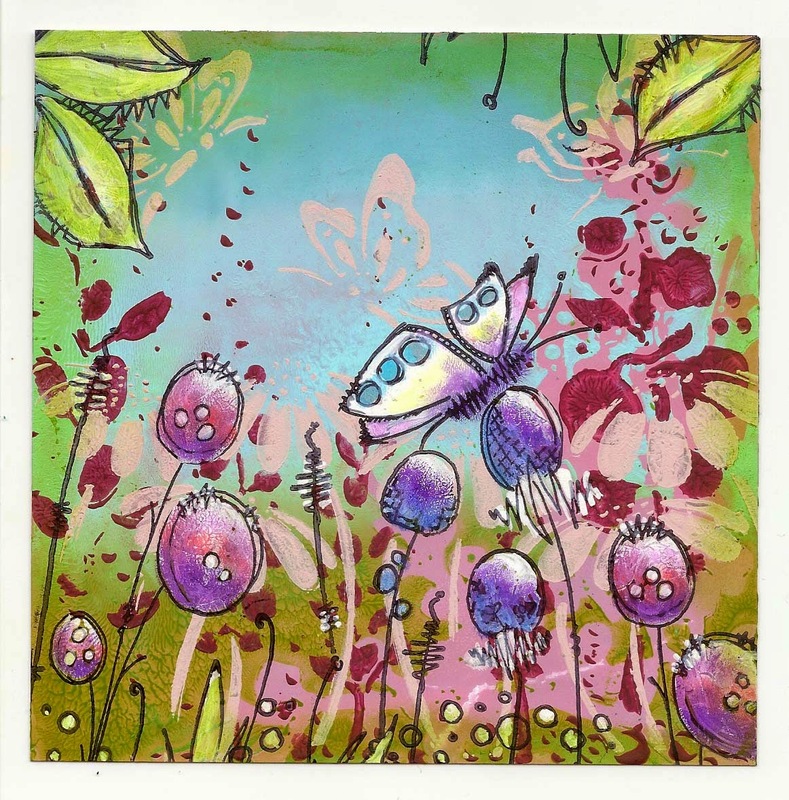 We were making mixed media canvases with various Pebeo products, PaperArtsy Lynne Perrella stamps, foiling and acetate flowers. Hello again. 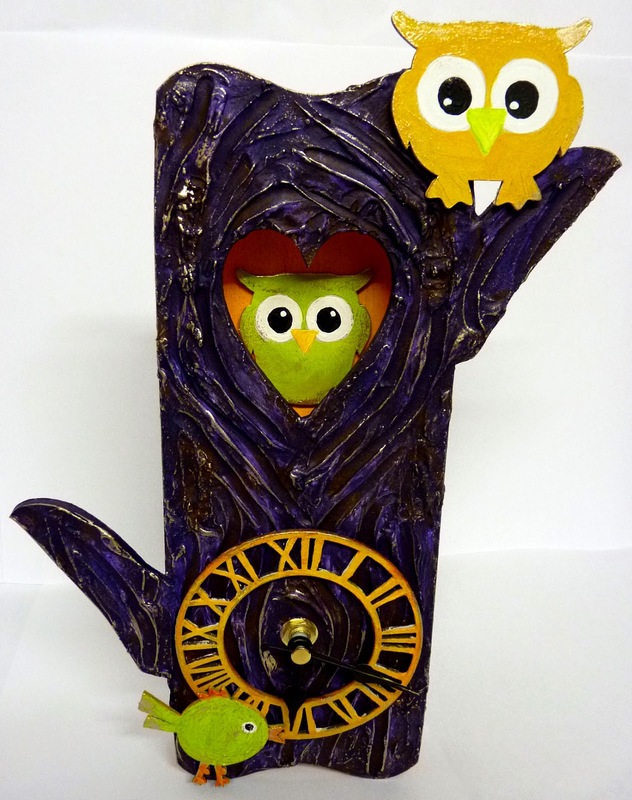 This weekend I thought it was time to assemble my Tando Owl Clock and inspired by all of the Halloween colours around I decided on bold purple and orange. First the front got a layer of PaperArtsy Grunge Paste and while still wet, a bark pattern was drawn in to it. The rest of the pieces were painted with a layer of gesso. The inside faces and clock dial were painted with a layer of PaperArtsy Fresco Finish yellow submarine and the remaining outer faces with eggplant. The textured front was painted first in a layer of chocolate pudding, right down in to the grooves. The ridges were then highlighted with lilac and when dry, a layer of eggplant was added. Eggplant is a translucent colour so the lilac could show through giving highlights and some of the brown was left showing in the grooves. Using autumn fire with a fairly dry brush, the edges of the yellow faces were given a distressed look. Having decided to paint first and then assemble to make it easier to get to the insides, I realised that once the pieces were glued together there would be bare patches where the pieces slotted in. More paste and more paint were needed to fill the gaps. It still seemed a little flat so a touch of treasure gold was used to bring out the bark texture. The kit comes with one owl but I added pieces from Tando Bird Set 1 Small. Great fun to make and very easy to assemble. 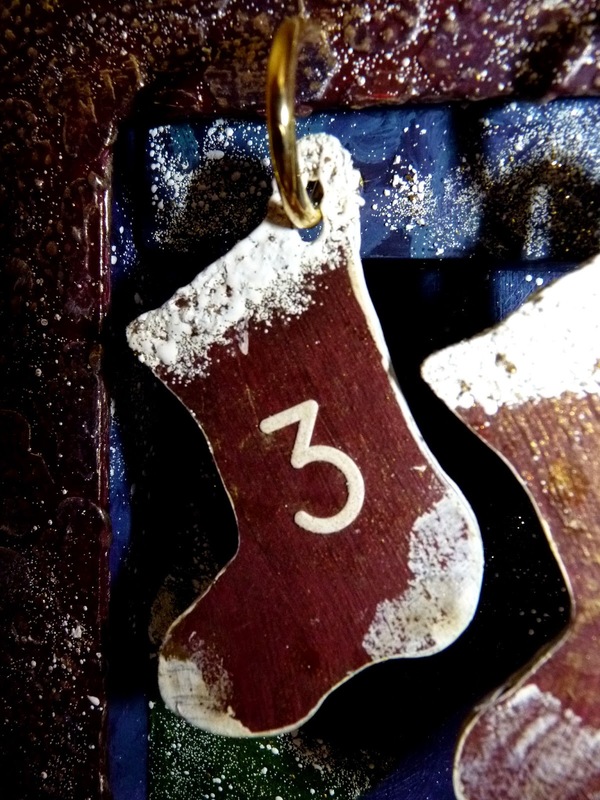 I'm entering this in Tando Creative's Challenge for November. Thank you for taking the time to look. It is about this time of year my sister puts in a request for some Thanksgiving cards for her American friends, so I thought this year I would get a head start. First the Sizzix Fern embossing folder was used on white card. Distress Ink was applied and built up in layers, the embossed areas coloured with Promarkers and leaves stamped around the edges. The stamped leaves were partially coloured in. Treasure Gold was lightly rubbed over the embossed area and smeared more along the edges. Two set of leaves were stamped, cut out, coloured and curved using an embossing tool on a foam mat. More Treasure Gold was applied to the edges of the leaves. Distress Ink was used to create a co-ordinated coloured background on a card blank and the leaves adhered with silicone glue. The wording was cut on an Original Silhoutte digital cutter. And there you go! Recent events have given me reason to reflect and be thankful I have such a great life. Last weekend I had a great time at The Craft Barn on a class with Gio. 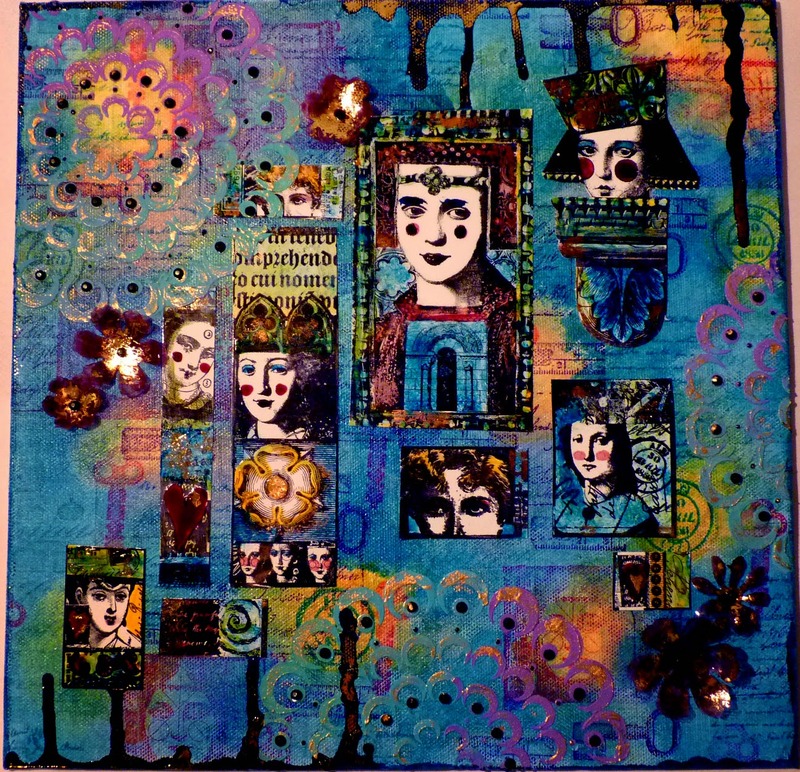 The project was a mixed media journal cover using our homemade stamps, stencils and masks. We chose a photo of a model from a magazine, covered the page in cellotape to make it more durable, and cut around the outline to create both a mask and stencil. We made our own stamps by die cutting sticky backed foam and mounting it on pieces of polystyrene packaging. We also used plastic draining board mats, plastic table cloth pieces, bits of lace and even a fan from the inside of a computer as masks. If you like this style check out Gio's blog Scrap in Progress. She's queen of upcycling and repurposing! Thanks for stopping by. Thank you for popping by. Here's something I made a couple of weeks ago. The kit comes in flat pieces and I did most of the painting while flat, just touching up the joins at the end. To start with everything got a cover of white gesso, except for the outside of the front and back pieces, which started with a layer of PaperArtsy Fresco Finish little black dress. Once dry a thin layer of crackle glaze was applied over the black and left to dry. For the base colours I used mermaid, guacamole and cheesecake. 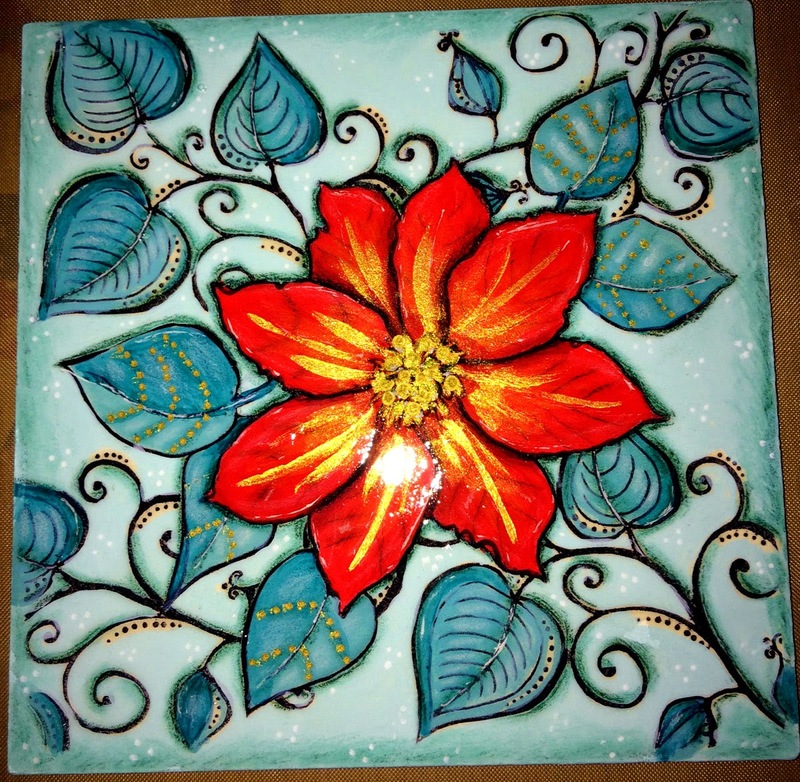 A good tip when using crackle glaze is to apply it with a piece of Cut-n-Dry foam to get a nice thin layer. When you apply the paint over the top it will start to crack quite quickly so make sure that you do not apply it too thickly and NEVER go back over it to fill in any gaps or you will just cover up the cracks. The roofs had an additional layer of a translucent shade (south pacific, yellow submarine and hey pesto) painted and/or stencilled on, with a little snowflake paint rubbed on the edges. 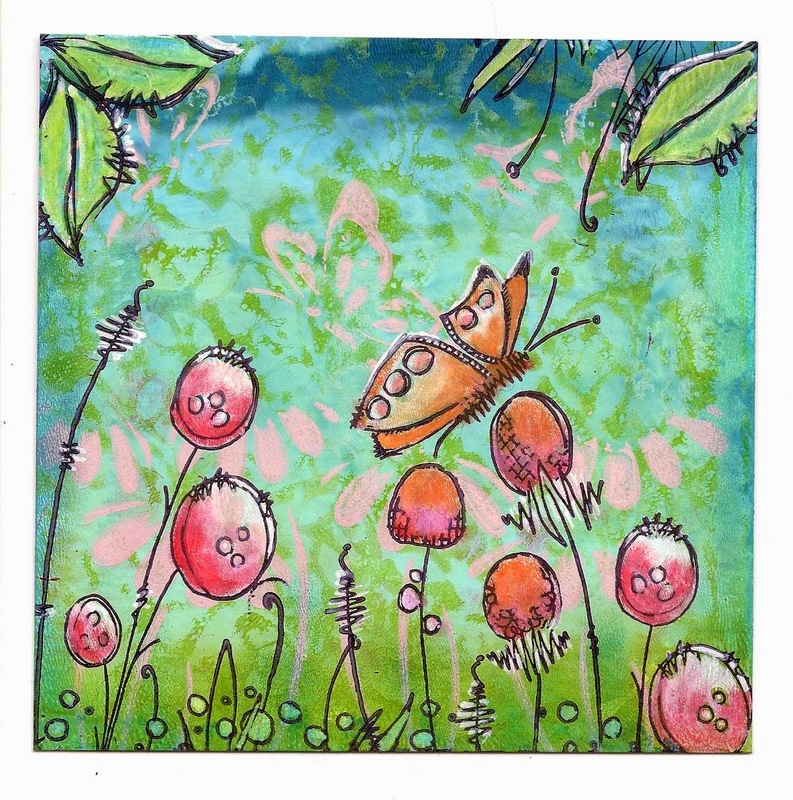 JOFY stamps were added with black archival ink and painted in with more Fresco Finish colours. 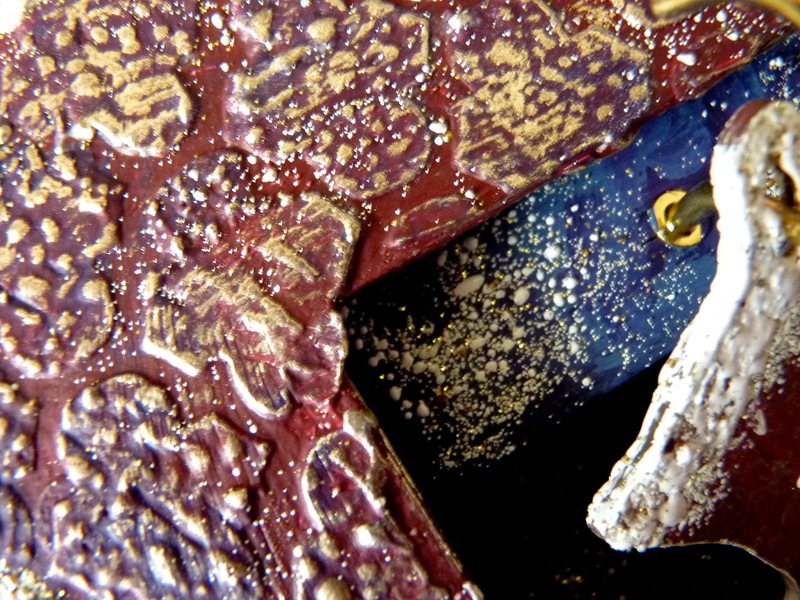 Then it was all glued together with Cosmic Shimmer glue and any gaps touched up with paint. It now sits on my window sill at work cheering me up as I plough through endless admin. 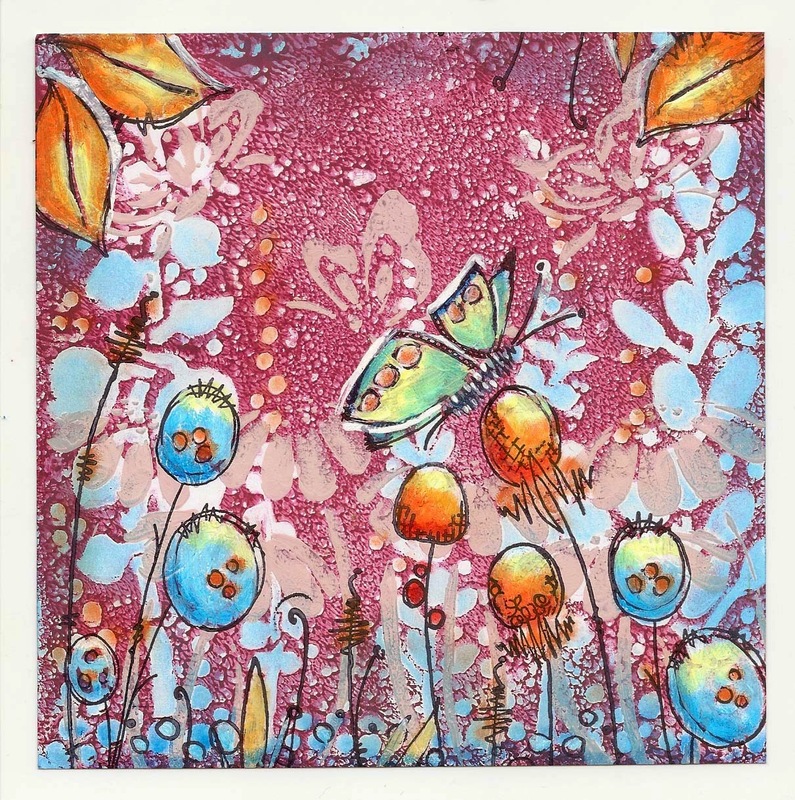 This started off as a Gelli Plate background using PaperArtsy Fresco Finish chalk paints with some additional stamping and stencilling. 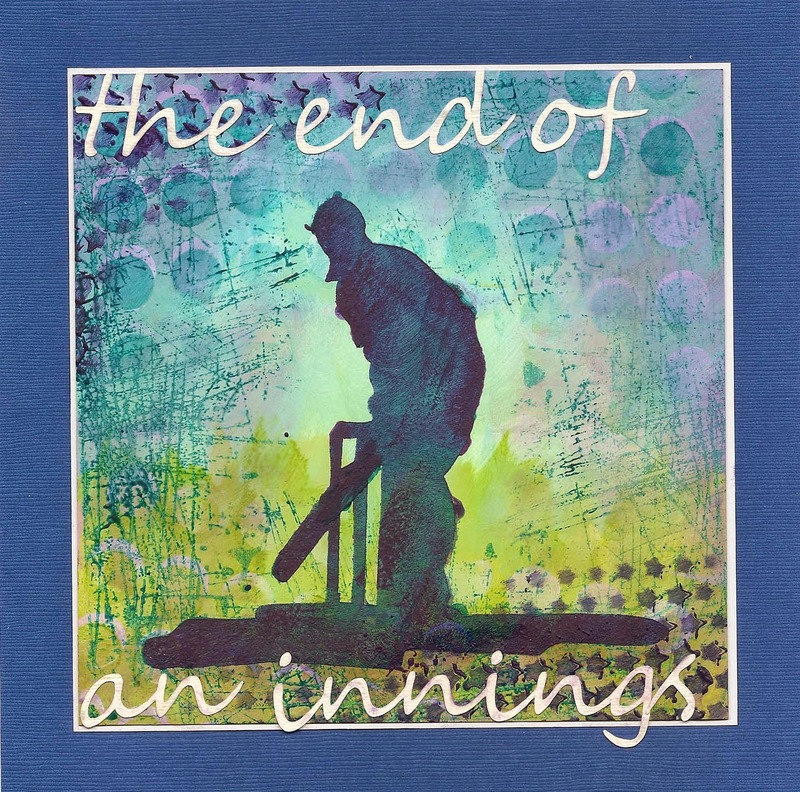 The cricketer was taken from a clip art image, printed on to card and cut out to leave a stencil. More paint was sponged through the aperture. 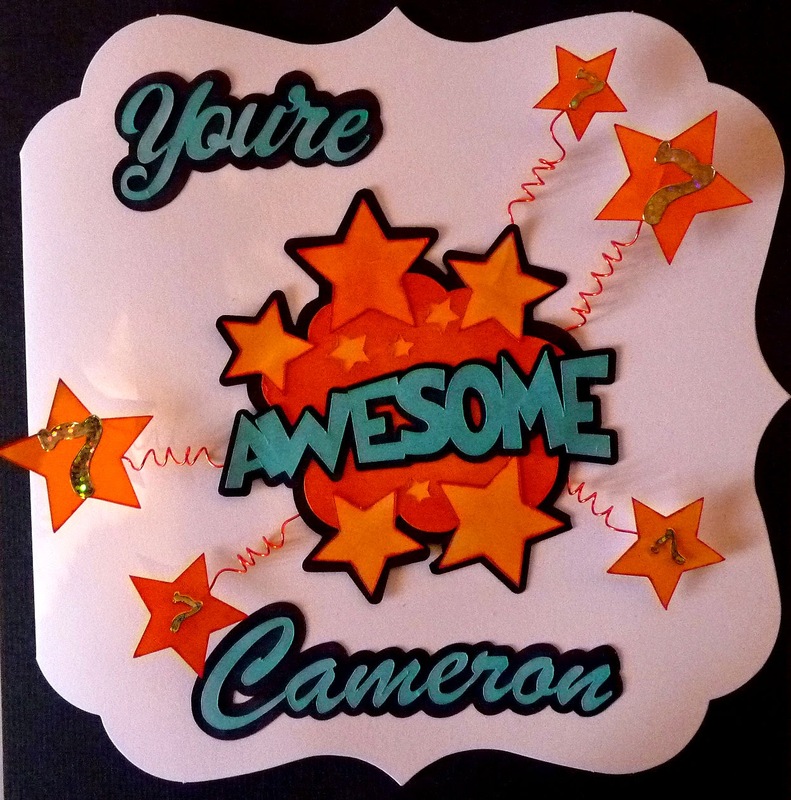 The wording was cut from white card using an original Silhouette digital craft cutter. To get started I thought I would share some cards I made earlier in the year. 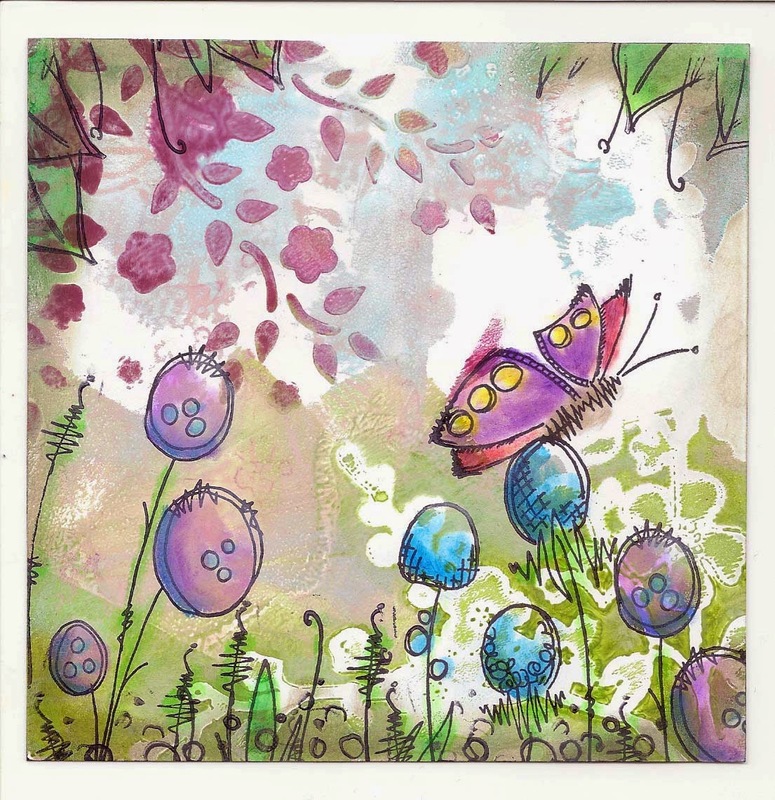 They have Gelli Plate backgrounds using PaperArtsy Fresco Finish Chalk Acrylic paints and a variety of masks and stencils. 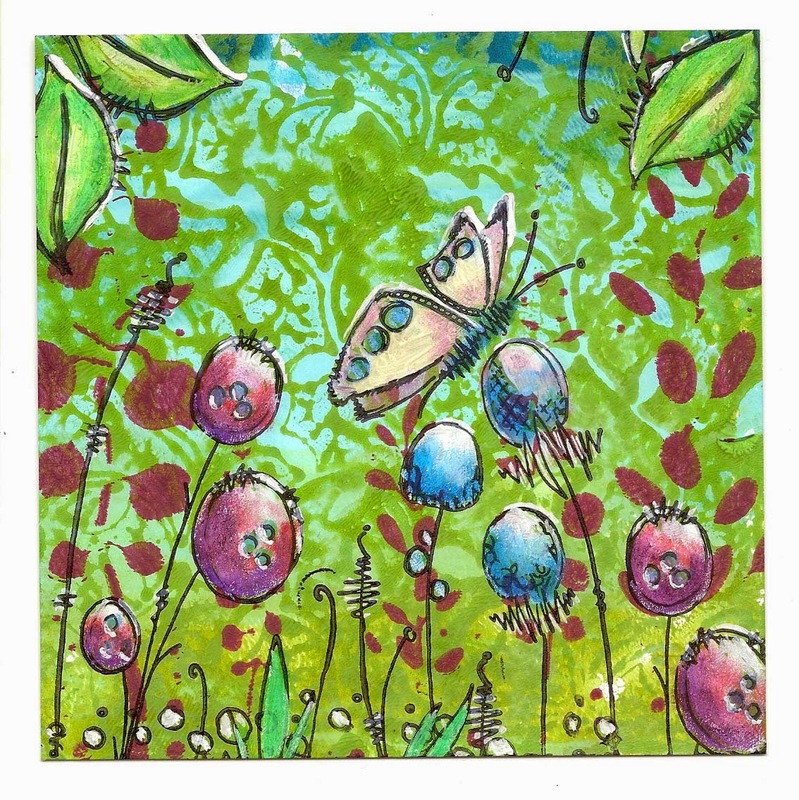 JOFY flowers and butterflies are stamped in black Ranger Archival ink and coloured in with Faber-Castell Gelatos, with a little white highlighting to finish off.